Architectural practice and design outlays require a certain amount of insight into a complex set of forces or demographics. At Digg Interiors we simplify the complex for you, making it easier for you to understand, visualize and literally walk through your space. Are you an artist, with visual bursts of inspiration or a time-pressed business executive? Are you a minimalist or a collection enthusiast or the housewife with that impeccable lifestyle or the new generation go-getter? Whether it is a luxury condominium or an apartment, a hotel or a restaurant, a holiday home or your residence, our 3D design experts at Digg Interiors will convert it to ‘the place’ which speaks for you, about you. An exclusively branded home or an office that you can call your very own. 3D interiors is the new art of living and Digg Interiors is your exclusive kind of designer to make it tangible for you. In today’s world, 3D architectural rendering is the way to look at your future, the interior of your home and your business. Feel the heartbeat, as we interpret the simple floor plan into a 3D house design, the artistic visual sketch into a 3D architectural design. Do you have your own ideas and plans that you wish you could incorporate in your home or business area? Online or otherwise, we will convert them to reality. Digg Interiors your one stop shop for interior designing, will guide you to incorporate those details into your own home or your business suite. 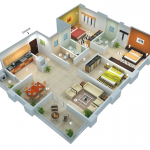 Whether it is your 3D home plan, 3D bedroom design, 3D living room design. 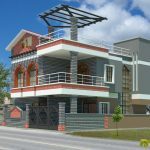 Any 3D interior or 3D building design of your choice. We do all this taking into account your budget, your traditions and most of all your comfort; leaving nothing to chance so you enjoy the ambiance to your utmost satisfaction. The interiors of your home or your business are where you spend the better part of your day. This is your personal niche that needs to be tended to with that special touch, making it yours and yours alone. Our 3D interior renderings make it possible for you, to be the creator, while our design experts at Digg Interiors collaborate and work with you at every stage with our exclusive 3D house design software. 3D being a technology driven solution, allows you the flexibility to tweak details before they happen. Now you can design every room of your home or your business space into an individual domain. Walk into Digg Interiors to make your philosophy of art into a 3D visualization of a dream come true.